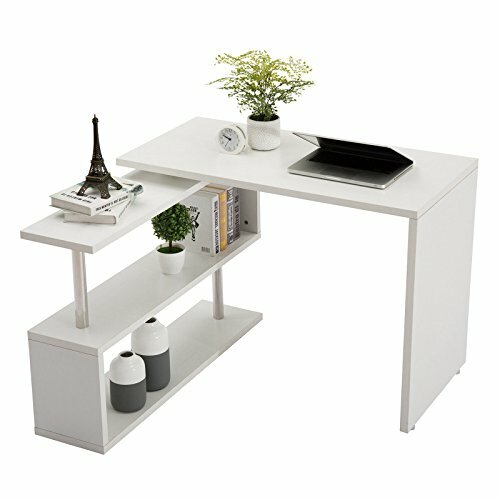 →L-Shaped Corner desk, great for a small space, have large leg room. Love the way that swivels to make an L or straight. →360 Degrees Rotating Office Desk, Desk and shelf rotate a full 360 degrees. Good depth to desktop and the side shelf holds printer scanner and cables out of the way. →40.32"L x 19.69"W, Rectangular workstation desktop for laptop, monitor or printer etc. →2 Tier S-shaped shelves with chrome support for files and books or displaying items. →Simplistic, clean yet stylish Elegance white color, made from 0.98"T MDF board, waterproof & aicratch-resistant.